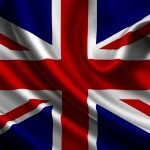 Home » Comedy » Grace Brothers to re-open Sunday – who wants to go shopping? 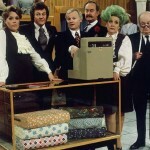 Sunday night on BBC1, as part of the channel’s Landmark Sitcom Season, it’s Are You Being Served, Again”… again. This time, however, it’s 1988 but we’re not on a farm of any kind. 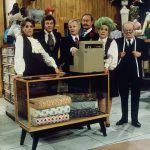 Grace Brothers is re-opening its doors and Young Mr Grace is determined to drag the flagship department store into, well 1988, but he has a problem on his hands as Mr Humphries, Captain Peacock, Mr Rumbold and Mrs Slocombe all seem to be stuck in another era. 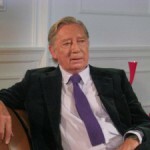 Sadly, with the entire original cast (including the co-creators/writers, David Croft and Jeremy Lloyd) having passed away, the turnover is 100% at Grace Brothers for the new effort. 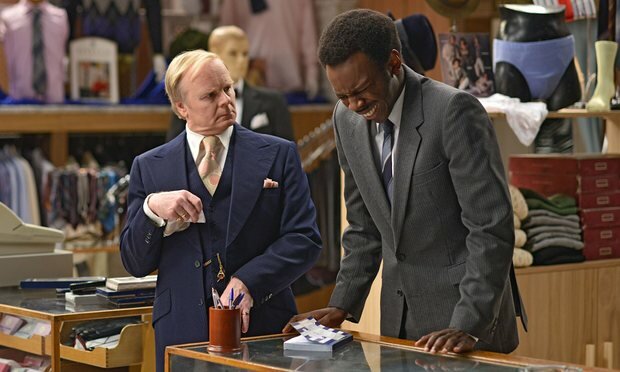 New ‘old’ employees will include Jason Watkins (Being Human, Trollied, Twenty Twelve, W1A) as Mr Humphries, Sherrie Hewson (Coronation Street, Emmerdale) as Mrs Slocombe, John Challis (Only Fools and Horses) as Captain Peacock, Roy Barraclough (Coronation Street) as Mr Grainger and Arthur Smith as Mr Harmon. Catherine Tate Show comedian Niky Wardley is set to play cocky Cockney assistant Miss Shirley Brahms, originally played to perfection by Wendy Richard in the original AYBS. Mathew Horne, best-known for his role in Gavin and Stacey, stars as Young Mr Grace, the original Mr Grace’s grandson, and Hollyoaks star Jorgie Porter as Miss Croft. Newcomer Kayode Ewumi, will play Mr Conway, described simply as a ‘new member of staff’ designed to help shake things up and take the place of Trevor Bannister’s Mr Lucas character who has mysteriously left Grace Brothers for the remake. At first glance, while now taking place in the final Thatcher administration, it still seems to have brought with them all the 70s innuendo comedy that so much a part of the original series. One does wonder just how many of the double entendre jokes will make it past present day BBC censors but, thankfully, Mrs. Slocombe’s pet obsession does seem to have made it as there are a few of Mrs Slocombe’s feline jokes that have made to the final version. Are You Being Served airs Sunday at 9pm on BBC1.